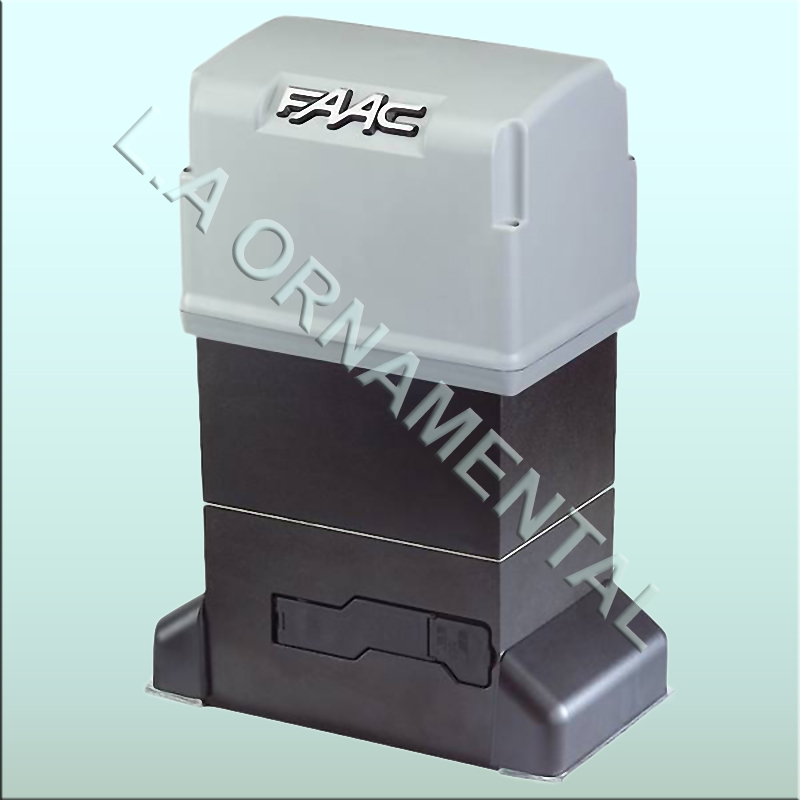 The FAAC 844 (1098372) Compact Slide Gate Opener is available in a rack and pinion or a chain model. The operator comes as a package containing the drive unit and electronic control panel. All external reversing devices and other accessories must be ordered separately. The electronic control panel installed in the cover of the 844 Operator is a microprocessor-based controller that accepts a full range of product accessories and reversing devices to allow the maximum flexibility in designing the gate system.The advanced design of the operator features a small, self-contained unit composed of an electric motor with a built-in clutch and a reduction gear box, both housed in a die-cast aluminum casing. The motor drives the rack or chain to slide the gate. An adjustable friction clutch is located on the input side of the gear box so that when torque exceeds a preset value, the drive torque on the output shaft remains at a constant level. The holding power of the gear mechanism ensures that the gate stays perfectly shut. There is no need to fit an additional lock on the gate. The electric motor, two-disc clutch, and reduction gear are completely immersed in oil that lubricates the moving parts and also dissipates heat generated during operation. The heat is dissipated through the outer casing of black anodized aluminum. The Manual Release mechanism, a key- and lever operated device, allows you to open or close the gate by hand whenever the need arises. The Manual Release mechanism is useful, for example, when the electrical power goes out and you want to open or close the gate. A limit switch assembly stops the drive motor when the limit switch plates mounted on the rack or chain are sensed. The limit switch is inductive and watertight to increase its reliability and functionality. The adjustable electronic braking system insures that the gate stops exactly where and when required.